This uninhabited island, only half a mile long by a quarter of a mile wide, is famous for its basaltic formations, distinctive stepped columns created when the lava of volcanic eruptions cooled many millions of years ago. 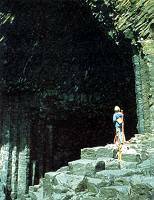 These columns form the cathedral-like stature of Fingal's Cave, immortalised by Mendelssohn in his celebrated Hebrides overture. Other famous visitors to the island have included Queen Victoria and Prince Albert, the artist J M W Turner, and poets and writers Keats, Wordsworth, Tennyson and Sir Walter Scott. 7 miles west of Mull and 6 miles north east of Iona. Cruises from Iona, Mull and Oban. Landing dependent on suitable weather conditions.